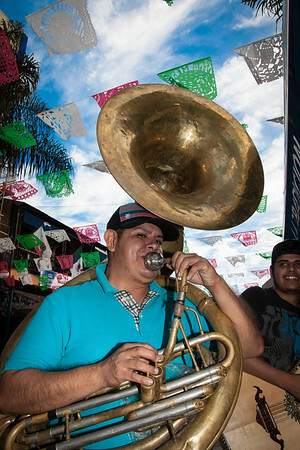 Three years of photographs from the redlight district of Zona Norte, Tijuana, BC, Mexico. 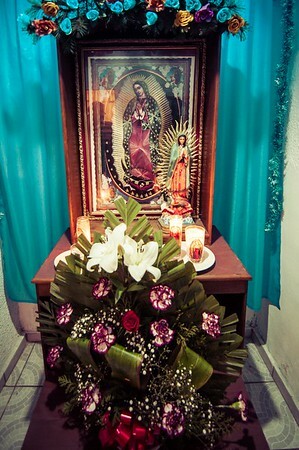 This shrine is located in a small room in one of the short-term hotels in Zona Norte where the girls take clients. Overall, Tina had a great sense of humor and we spent a lot of time laughing. This is her room for the day. It's in a hotel in Zona Norte and she pays about 6.50 USD for it daily. The graffiti on the walls was there already. 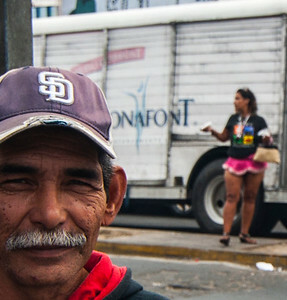 From Zona Norte - he sells Chiclets gum on the street. She likes to create collages and was excited to show us her work. Gregg was waiting for Jessica to arrive back to his hotel room. She had gone to get some heroin for herself after he gave her the money to do so. He is a former addict, but hasn't used in many decades but still likes to hang out with addicts. Pat has lived in the Zona for almost 20 years, however, she speaks almost no Spanish. I had met her on a previous trip down and on this day, I offered to buy her a few tacos. It was quite funny with us both trying to figure out how to say that she wanted onions on her asada taco! Update: in the summer of 2017, I received word that Pat has passed away in the local hospital. I know she had epilepsy. It was widely rumored that she also had HIV but I do not believe that is true. I have not spoken with her husband since she passed. Unlike many of the expats working in Zona Norte, Christy is completely fluent in Spanish, even having the correct accent. She says when she gets tired of Zona Norte and the life, she'll go back to the US, get in rehab, and then become a drug counselor. Update: Christy left Tijuana in December 2016. She got in a sober living program in San Diego and is doing well, maintaining her sobriety as she develops living skills for functioning in the US. Tina in a quick pose on Revolucion. 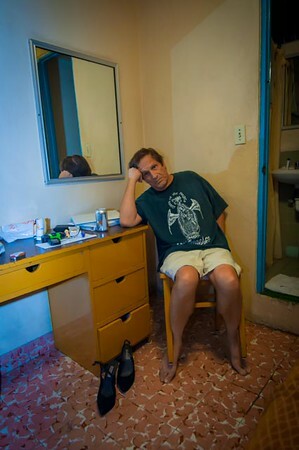 She is a transsexual from Costa Rica, but has also lived in the US in North Carolina. Alex speaks excellent English. He is coy about what he does and where he's from but he's lived here at the Kumbala for many years. After we got to know each other a bit more, he told me he's a writer and is working on writing a mystery novel. He explained the storyline to me and frankly, I think it is brilliant. It's not finished yet. Jessica had a stash of food in her room and as we went to leave to walk to my fixer's hotel, she grabbed an apple and some peanut butter to eat on the way there. The peanut butter is in the Styrofoam cup in her hand. 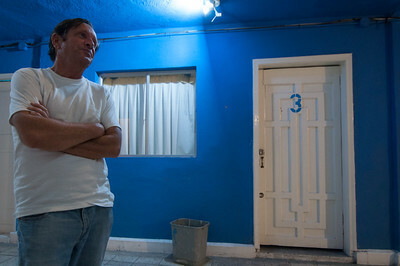 Pat has lived in Zona Norte since the late 1990s. She was a dancer at one of the bigger strip clubs during that time. She reports that she made 800 - 1000 pesos a day dancing. Yesterday, I saw Pat (she has been wearing this same shirt the last four times I've seen her over this past month) and her husband was with her. They have been together for more 25 years. We ducked into a bar in Plaza Santa Cecelia and Tina fixed her makeup. She was dancing and tossing pesos as a part of a joke from earlier in our day together. My fixer had asked me to not show his face in the photos I was taking but he also had a small throwaway camera and said I could shoot his face with that one. However, I was using my wide angle and as you see, there are several shots with his face. We discussed it today on the phone and he said it was fine to use whatever shots I took. He just didn't want his stateside wife/girlfriend to see the photographs. Jessica looks at a painting of herself done by my fixer some time ago. This is the first time she's seen the painting. She liked it very much. He gave her the print of it. 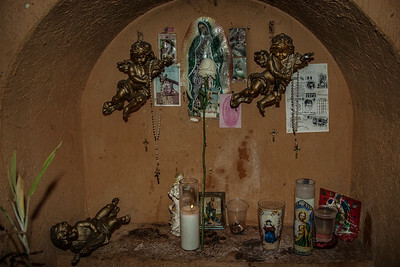 There is this shrine inside La Hacienda bar. I've not seen a shrine inside any of the other bars so far. Raulus, my mesero there, graciously allowed me to come in and photograph it. 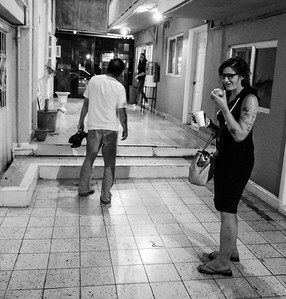 Photography is frowned on in Zona Norte to protect the anonymity of the girls and customers. I don't shoot on the sly and always with permission to respect the people that live and work here. 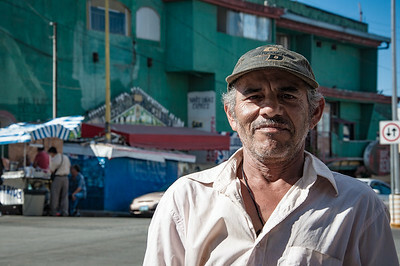 I have been going there since May 2015 with my camera gear always open and around my neck and if asked, I explain that I am documenting the Zona Norte neighborhood as part of a project for my schooling. On the streets of Zona Norte in front of Hong Kong Club that was celebrating their anniversary that day. We went to Jessica's "apartment". 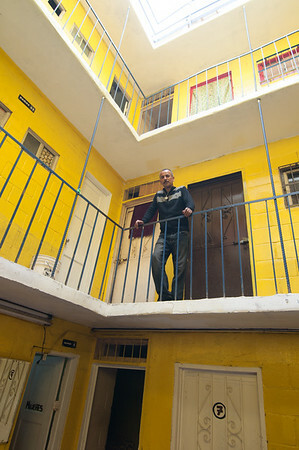 She pays 160pesos/night to live there - about $10 USD. Unlike Gabby's apartment, Jessica's has a bathroom in the room, though the toilet doesn't work right now. A J-Lo shoebox was on her bed. She opened it up and showed us all her used needles. She keeps them to swap out at the clinic. They will allow the addicts to trade in three used needles a day for new ones. My fixer is discussing whether or not they are going to spend the night together.... known locally as a TLN - Toda La Noche. He decided to spend the night with her. 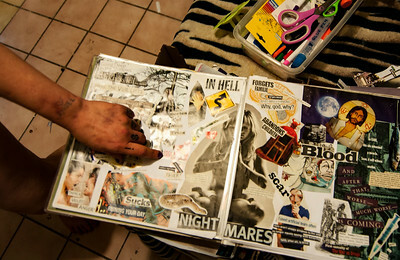 Jessica writes poetry and keeps notebooks of her work. She allowed me to look at them and I found this page tucked in to the pages. The words on the page with their definitions: dumbfound, ebb, eccentric. Jessica has developed a severe infection on her upper thigh from all the drug use. The spot is warm to the touch. She has some antibiotics but says she doesn't want to take them. This is Christy. 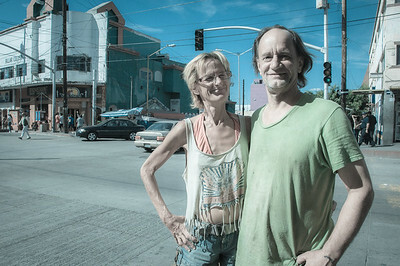 She came to Tijuana in the late 90s for "the cheap drugs" and has lived here ever since. She told me that yes, she's an addict (heroin is her drug of choice; she shoots it in her neck) but that she's also addicted to Zona Norte. There's "always something going on", she says. The tattoo on her chest says "Take a Chance on Me". She told me there is a free clinic nearby that will remove tattoos for people who want to start over. She said she's considering having it removed. As I crossed the street after talking with Pat and Jim, this man approached me and said, "Take my photo, please!" So I did. His name is Perro. I shot two quick photos and we both headed our separate ways. When I mentioned I wanted to take a picture of her under the Floor Show sign, she immediately ran over to the doorway and fell out on the sidewalk as a "floor show". 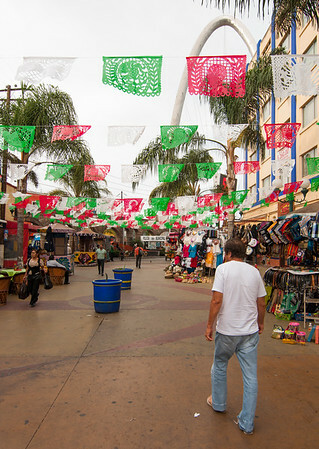 Lots of vendors and musicians populate this plaza on the weekends. On a Tuesday, it was fairly quiet. Jessica began to tell us that she had fallen a few days prior and she had cut her foot on some glass and these "very very tiny little almost invisible strands" that were wound all over her hands and in her eyebrows and on her feet. She told us she had trouble getting them all off of her and that people thought she was crazy when she would talk about these tiny strands and try to show them to people on her hands. She claimed that she could still feel them all over her appendages and eyebrows. As such, she has pulled out most of her eyebrows attempting to "remove the strands". This is a manifestation of Morgellons Disease, which is believed to be psychosomatic in nature. She was embarrassed about her dirty feet. This is a typical working outfit for Christy. She says she doesn't bother with the typical "ho shoes" as the sidewalks are a mess in Zona Norte and standing in them is uncomfortable. Regardless, she has quite a few clients including several regulars. She also told me that one morning, she had come down from her hotel room with her Maltese dog to take him out for a quick pee. She was wearing footie-pajamas as it was cold out. One of the mongers saw her just steps outside her hotel doorway and asked if she was working. She said, "You want a date?" He did and up they went. "It takes all kinds," she says of the encounter. 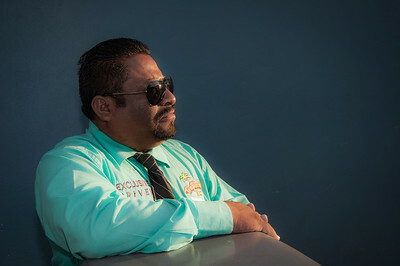 Angel works the day shift at the parking lot in Zona Norte where I usually park my car. The first few times he drove me around in the golf cart, he said he didn't want me to take his picture. But this time, he saw the other pictures I had printed to give to some of the folks and he decided that I could take his photo.